There is a scene in the middle of David Fincher's latest film, The Curious Case of Benjamin Button that really struck me, and seems to fit the entire theme of the movie. In it, Benjamin narrates a short section in which a woman is delayed when she hails a cab. She talks on the phone, grabs her jacket. The cab driver had gotten a cup of coffee earlier, and because of this, he picks up the woman. The two of them are further delayed when the package that she goes to pick up hadn't been wrapped, because the girl who was supposed to wrap it had been late because she had just been broken up with. Once the package had been wrapped, a truck pulled out in front of the cab, and at that point, Daisy, while talking with a friend, left the building, in time to meet the cab as it passed by, knocking her to the street, shattering her leg and ending her career as a dancer. Benjamin notes that had any one of those events not occurred, Daisy and the passing cab would have never met. This point resonates throughout the film. 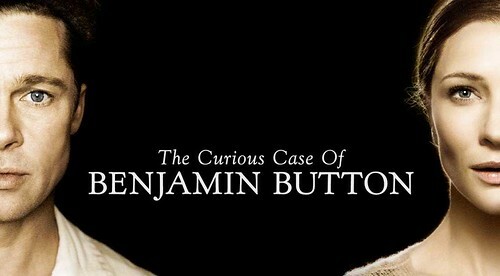 Benjamin Button is a strange man, and his tale is even stranger. When he was born, he came into the world with the body of an eighty year old on death's door. From that point, he goes backwards, getting younger as time passes him. He lives with his adoptive mother, who lives and works in a retirement home. It is there that he meets Daisy, whom he falls in love with from the first moment that he catches sight of her. Because of their different ages, his advanced, hers not, they form a curious relationship, one that intersects at various points, before they finally meet in the middle, before each continues onwards. This film is nothing short of brilliant. It is complicated and deliberate throughout, with a touching, tragic and somber story throughout. The entire film has given me a lot to think about with a number of the themes that are presented here. Loss is probably the most prevalent theme throughout the story. Benjamin grows up in a nursing home, and as someone who appears old, he grows up in the company of elderly. Those whom he makes friends with don't last long, and the only constant in his life is Daisy, and even then, because of their respective ages, lose one another throughout their lives, only really finding each other as they grow closer in age, at which point, life reaches perfection. But, like all things in life, this doesn't last long. A woman that he meets in the beginning says the following: We're meant to lose the people we love. How else are we supposed to know how important they are? It is because of this, she says, that people realize the importance of one another. The film itself is a masterpiece of coloring, scoring and direction. From the beginning, there is a stark difference as the film opens in 2005 in New Orleans - Blue, gray, drab and modern, and this appears periodically as the film flashes forwards to a dying Daisy, as she lies on her deathbed. When the film goes back in time, the colors deepen and feel like the earlier 1900s. As the story progresses, the lighting and coloring changes to match the time period; Grainy, grayish and rich during the 1930s and 40s during the second World War, washed out and bright during the 1950s and 1960s, and so forth. This works well with a film that covers a number of periods, and helps give even more of an appearance of forward progression. One of my favorite composers, Alexandre Desplat, scored the film. The music here is absolutely gorgeous. It has a light touch, that is flowing and dramatic, and it fits with the film absolutely perfectly, and is easily Desplat's best work since Syriana. Another theme that's present in the film is destiny. Not so much in a religious or spiritual sense, but more in the way that the story described. Another quote from the film helps to describe this: Our lives are described by the opportunities in our lives, even the missed ones. Everyone's lives in the film follow this, especially Benjamin's, and he is in a unique position in life to really see this - he is starting life from the end, where his body is failing him, and throughout the film, he seems to be able to really understand life, and to live with very few regrets. His life is guided by opportunities throughout his life, and ultimately, defined by them. Ultimately, despite the constant theme of loss and death, the film is about life. The characters here are in a unique position to witness it, and, while their circumstances are tragic, their story is one that is full of insight. I personally took a lot from it.